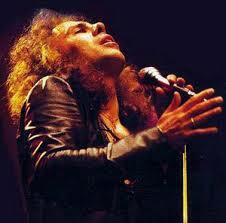 The Urban Dictionary defines a ‘legend’ as “someone or something whose coolness extends beyond all space and time.” That, my friends, totally sums up Ronnie James Dio. Sadly, I never met they guy to know whether or not he was a gentleman, all I know was that growing up I was simply awestruck by the quality and power of his voice. And of course wishing I could sing like him! I’ve had the great pleasure of seeing him live twice and it was probably the closest I’ve ever got to hero worship! He was (and still is) one of my most loved and enduring inspirations, not just because of his voice, but also because he simply kept on and on writing and performing really great songs; powerful, passionate melodic and thoughtful. That’s where his main inspiration lies for me; the consistent quality of his output. He was unquestionably someone who discovered their God-given gift and lived it to the max. A few years back I gigged at the Cheese and Grain in Frome with my old band. It was a great venue, one of the few times we had a decent sound guy; this enormous but mellow dreadlocked American guy with a southern Californian drawl. We sound-checked with Holy Diver and I’ll never forget his reaction “WOOOAH Holy Diver, I was NOT expected that. That was totally aaaawesome”. Yup, you got that right. This entry was posted in News and tagged alternative rock from bristol, black sabbath, british female rock singer, Cheese and Grain, classic metal, dio, English female rock singer, female fronted rock; femme metal; female rock; classic rock; heavy rock; bristol rock; janey summer; melodic rock; alternative rock, Frome, gifted, holy diver, inspirations, legend, melodic rock, powerful rock, rainbow, Ritchie Blackmore's Rainbow, ronnie james dio, straight through the heart, urban dictionary. New tour dates added – and a great bit of press! Acoustic gig schedule coming through!